Our customer operates with a conveyor transfer point fed by a second conveyor that has a feed angle of 90 degrees. 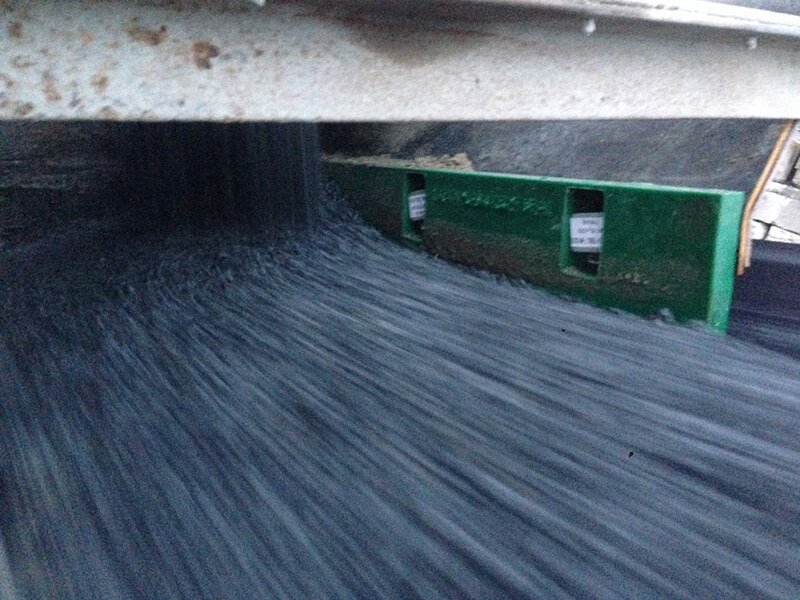 The weight pressure of the falling material was pushing the conveyor belt itself off-centre, becoming misaligned and causing material spillage. At a production rate of 300 tonnes per hour, the fugitive material quickly accumulated, causing the trough rollers to seize up as well as creating a trip/slip hazard to workers. The associated conveyor skirting and steel holding plate in close proximity was subsequently showing signs of premature wear. Located in a difficult area, the 12mm traditional rubber skirting could not be changed without considerable effort. Belt misalignment caused by material loading effects is a common problem. Spillage should be cleaned-up quickly otherwise it can create personal injury risks. If not resolved effectively, the problem of spillage can lead to significant structural damage to the conveyor as well as lengthy interruptions to production. K-Containment Seal was installed inside the chute wall and the spillage problem at the feed conveyor from trucks to the storage aggregate bins has been resolved – our customer is delighted. K-Containment Seal is available in different engineered polyurethanes depending on the level of abrasion resistance required. It also has steel-backing for enhanced durability which was ideal for the high internal pressure experienced at this transfer point. Already it has exceeded the operational performance of the previous skirt. In time, when wear signs are observed, it can be adjusted lower so that once again a tight seal is achieved. The low friction properties of K-Containment Seal ensures that the risk potential for material entrapment between the skirt and the belt is minimised.